El libro de Shakespeare brings the work of William Shakespeare to life with full-color photography, images, idea webs, timelines, and quotes that help you understand the context n of Shakespeare's plays and poems. From Shakespeare's most-famous plays, such as Romeo and Juliet and Julius Caesar, to less-frequently performed works such as King John and Henry VIII, every play of the Shakespearean canon is collected in this comprehensive guide, along with his major poems and best-loved sonnets. In El libro de Shakespeare each play includes an at-a-glance guide to story chronology, so you can easily get back on track if you get lost in Shakespeare's language. Character guides provide a handy reference for casual readers and an invaluable resource for playgoers, and students writing reports on Shakespeare. 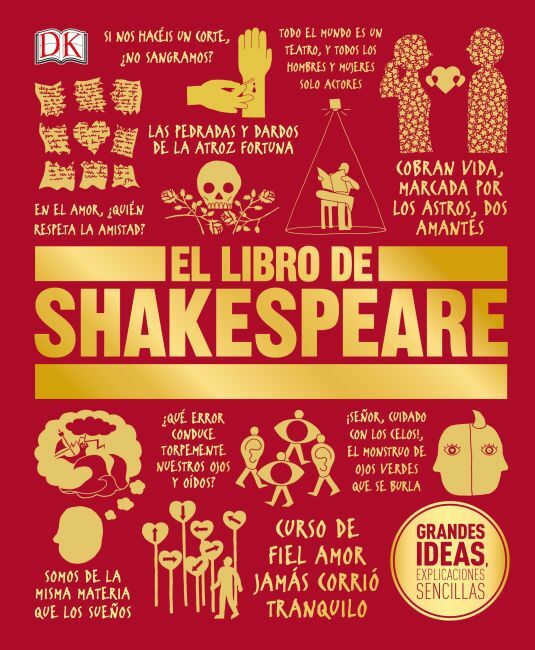 Packed with infographics and explanations of plots and including an introduction to Shakespeare's life and times, El libro de Shakespeare is the ultimate guide to understanding the work of William Shakespeare.